​Despite the hatred Raven harbors for their kind, he is intrigued by the witch. One taste of her lips, and she becomes his obsession. Soon, he discovers that fighting against the passion they ignite in one another is futile. But as they strip each other’s secrets, a powerful force threatens to destroy them both. When the day was night and the night was day, a witch was born in a raging thunder storm. The earth trembled and shook, welcoming its destined fate … hundreds of witches sang—salvation finally in their grasp. The prophecy once foretold was alive in a form of true beauty, with only death on her mind. Despite the darkness of her curls, they radiated light as they bounced up and down. Sunshine played on her face and her lips curved into a glowing smile. Mischief sparkled in her deep light-blue eyes, giving a glimpse of his daughter’s true nature. Her expression turned even brighter as she stretched out her hands and proudly revealed an exotic purple flower. “Amira, sweetie, where did you get that?” His wife examined the blossom in the child’s small palm and narrowed her eyes. Instantly Deron knew the answer—she hadn’t found it. Once again their daughter was playing with magic, doing tricks even his beloved Eliana couldn’t—a witch strong and talented, who had practiced her art for many years. Amira’s smile widened, but not a sound of explanation flew out. “It doesn’t belong here. Why don’t you take it back?” Eliana suggested. Surprisingly, the little one obeyed. “I am scared, Deron,” his wife confessed. The fear for their daughter’s safety etched the lines of her delicate face. Worry and concern cast a shadow over her beautiful eyes. He took her into his arms, trying to stay strong for her, to comfort her as best as he could. The truth was, he knew those fears all too well. A few years ago, the Order of Venlordia had renewed their witch hunts. No longer were the friars satisfied with sermons, it seemed. No longer were they leading people to salvation with the help of prayers and faith. They had raised a sword in the name of a sacred cause—to eradicate the evil. It was a ludicrous lie the Venlordians spread to justify their actions. Every few hundred years or so, they raised impious war against witches, be they good or evil. They didn’t differentiate. Worse still, thousands of innocents suffered at their hands. And now the bloodshed was commencing all over again. “You are safe here, you both are,” Deron tried to reassure his wife. If he was certain of anything, it was this place; and the people of Trinton, who would protect their daughter no matter what. He relied on them, just as they relied on him and his family. They all contributed. All did their share in keeping the town clean and free of marauding witch-hunters and the self-imposed law of the Venlordians. Something he wished he could relieve his whole country of. Unfortunately their organization ran deep, deeper than any of them thought. Even his brother-in-law, the king himself, began to squirm uneasily in his throne. No wonder Eliana was afraid. “Mummy, mummy.” Amira’s tearful voice shook Deron. “What is it, sweetie?” her parents asked, almost in unison. Eliana immediately scanned the area looking for the “her” her daughter was so worried about—only there was no one around. Still, Amira kept crying. Pearls of pain were rushing down her pale cheeks. Her lips trembled. Eliana cupped her daughter’s jaw, searching for an answer—pain was all she could sense, but she couldn’t fathom the origin of it. There was no wound to be seen, only cries of agony no child should suffer. The shaking came next. Amira’s small, limp body quivered in her father’s arms and fresh sobs broke from within her, consuming her with the ferocity of a flood, with each wave taking her even deeper. For a second there, it seemed as if their daughter was about to choke, but then a line around her mouth thinned and a sound, strangled and foreign, escaped her parted lips. The sound shook Eliana so deeply, she gasped, trying to take a breath into her frozen lungs. Tears filled her eyes. She heard grief and she heard terror coming out of her daughter’s throat—in someone else’s voice. “What’s happening?” Deron demanded, carrying their girl inside, straight to her soft little bed. A feeling of uselessness overwhelmed her. She was supposed to know these things, be able to make them go away, but the fact was she knew nothing about what was happening, and even less about what she should do. The elderly man gently righted her, and without so much as a word put something in her hands. Eliana looked at his offering for a moment, not comprehending what she was holding. Then she exhaled. “Thank you,” she hugged the butler fiercely, grateful beyond words. If only she knew what to use—Eliana’s next thought made her hands tremble even more fiercely. She didn’t see Giles’s concerned expression anymore, or any of the pale faces standing behind the man. Eliana focused her attention on Amira—a thrashing and moaning girl, whose hands fought an invisible foe. Her daughter’s face was twisted with pain, her eyes red from crying. She kept pleading for help for someone, but whoever it was lived in Amira’s dreams alone. Or nightmares, Eliana thought, picking a catnip plant from the vast collection of herbs she kept. She hesitated to choose a second herb, glanced at her husband’s expectant gaze, and swallowed a new lump of trepidation. What if she chose the wrong one? What if she harmed her little angel? Eliana had never felt so lost before. Utterly unable to identify the cause of such terrible pain. “You can do it,” Deron whispered, his belief in her giving her strength to make a selection. Eliana nodded, mixed the herbs and began the chant. She forced her daughter to consume the potion, all the while desperately praying for a miracle. A prayer that was joined by a dozen more people as the entire mansion kept vigil on their little lady’s sleep. All the servants gathered in the hall, waiting. Some of them sat quietly. Some paced with their heads bowed, hands clenched in fists. Others simply watched the closed doors. But all of them hoped to hear those doors opening. Hoped to see black curls bouncing, and that sweet face laughing. Sadly, none of that happened. When Amira finally came out of her room she was just a shadow of the sweet girl they all knew and loved. ". . . the internal conflict developed in Amira is monumental . 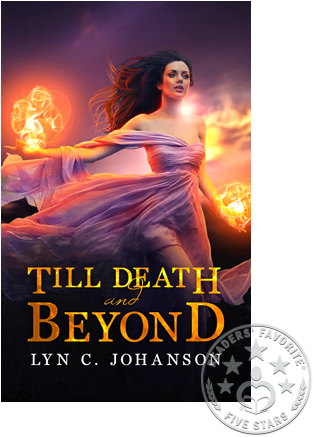 . . Lyn C. Johanson knows how to arrest the attention of readers with her beautiful prose and believable characters . . . readers will sit on the edge of their seats, anticipating what could happen next"
"The ending kept me turning the virtual pages long into the night." "Goddesses, witches, demons, immortals . . . ​you will not be disappointed with this book!"